To create data used for logic, rules, or mapping within any part of the Kibo eCommerce platform. For example, gamifying storefront purchases with entity lists. The Kibo eCommerce Entity Management System, which can be thought of as a schema-less database, is best suited for these scenarios. To create visible site content for the retailer’s storefront websites and native applications. For example, posting press releases with document lists. The Kibo eCommerce Content Management System (CMS) is best suited for these scenarios. In Kibo eCommerce, each object is stored in a list. Both the Content Management System and Entity Management System support custom list creation. A list is similar to a database table, describing the types of data that can be stored, which properties should be indexed for high-scale retrieval, and the list’s read/write security model. Currently, you can create lists with the Kibo eCommerce API or Arc.js applications. An object is an entry in a list and is similar to a row in a database table, though Kibo eCommerce objects are rich JSON structures rather than fixed tabular rows. Website content and mission-critical data may be stored in objects and retrieved for use throughout the Kibo eCommerce platform and third-party applications. Caution: It’s possible to create entity lists with custom strings after the namespace (e.g., namespace_tenantid_siteid). However, Kibo eCommerce doesn’t support migrating entity lists with custom strings after namespaces from a sandbox to a production tenant. Use only the namespace of the Dev Account in which the application was developed to avoid issues migrating content to a production tenant. Every document list has a views property, which can be used as a security mechanism to mask certain properties of, or determine which users have access to, a list. For example, an administrator may have access to the full document list through an “administrator” view, whereas designers may only have access to a subset of the documents and/or subset of the properties through a “designer” view. Views can also support filters, which have the ability to limit which documents are returned by GET operations from certain views. The filter for a view uses the same query syntax as the standard Kibo eCommerce API filters (’Id eq foo’). When viewing custom data in Admin, the list of fields that appears as columns in the grid is determined by the fields defined in the views property. Each field must indicate whether or not it is sortable. All view fields can be queried. Note: To render a list of documents or entities in Admin (Custom Schema and Site Builder), you must create a view for it and set the isVisibleInStorefront property to true. Views are similar to traditional relational database management system (RDBMS) views and can filter the documents/entities and alter the schema in an underlying list. Note: Only view fields that target underlying indexed fields in an entity list can be indexed. Any queries against non-indexed fields in an underlying entity list will not be indexed and can result in very slow response times. Custom Schema—Displays the objects within a given document list and allows Admin users to create, edit, delete, and publish documents using custom editors. Site Builder—Displays document lists and documents in Site Builder > Editor > Content > Pages and allows Admin users to edit and publish documents from a page template or widget. Note: You must configure a template with an include_documents Hypr tag or theme widget to render a document on your site. Refer to Render Documents on Your Site for more an example. Refer to the documents custom schema example to learn how to leverage the .NET SDK to create an editor through the Kibo eCommerce API. To display documents on your site, you must configure a page template with an include_documents Hypr tag that points to your document list. Refer to Render Documents on Your Site for more information. Drafting and Publishing objects is required. Only document lists support this. Active date ranges are required. Only document lists natively support this feature, including storefront preview. More than 2,000 objects must be sorted or filtered by one or more custom properties. Only entity lists support indexing properties and should be used in this scenario. As a game retailer, you may want to gamify storefront purchases for shoppers, so that whenever a shopper purchases a certain set of products, he is awarded a particular achievement badge. You also require the ability to define new purchase conditions (achievement rules) and badges. The Kibo eCommerce Entity Management System provides a flexible approach for authoring and executing these rules. Finally, you create a Kibo eCommerce Arc.js application to evaluate the achievement rule entities during the checkout process. If the checkout event satisfies a rule, the system awards the shopper with the corresponding achievement badge on the checkout confirmation page. Additionally, you might create a Kibo eCommerce application to alert the shopper via email that an achievement is earned. The application evaluates the achievement rules whenever the Kibo eCommerce platform fires an Order Opened application event. The application then evaluates the rules against the order to see if any products satisfy a rule, finally sending an email with any earned achievements. You may want to post press releases or blog posts to your site on a regular basis without the assistance of a developer every time you need to do so. 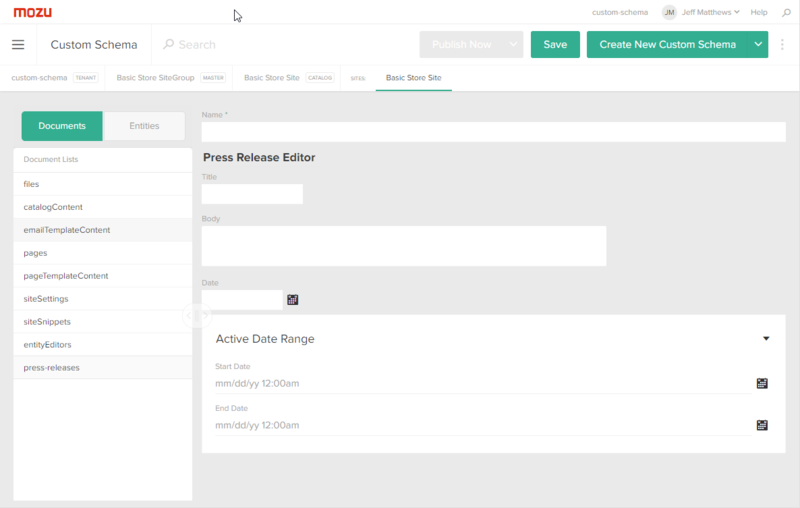 With the Kibo eCommerce CMS, you only need a developer to do the initial configuration so that non-developers can add, edit, delete, and publish documents through the Admin interface. Note: You can use the API to programmatically create documents in bulk. This example focuses on manually administering documents using a custom editor. Creating Hypr templates that use Hypr tags and adding them to your theme to render documents on your site. Adding a page to the navigation bar. This example explains how to create a .NET console application in Microsoft Visual Studio that configures all required schema for posting press release documents on your site. The following console application leverages the Kibo eCommerce .NET SDK. Log in to Dev Center. Create a new Kibo eCommerce application. Add the Site Create Content and Site Create Document List behaviors to the application. This step is required to grant your application the necessary permissions to create custom documents and document lists. Install the application to the sandbox of your choice and enable it in Admin.Note: If you decide to add additional behaviors to your application after this step, you must reinstall the application to your sandbox and re-enable the application in Admin to apply the new behaviors. Note the application key, shared secret, tenant ID, and site ID. Tip: You can obtain the application key and shared secret from the application details page. You can obtain the tenant ID and site ID by viewing your live site through Site Builder and looking at the URL, which has the pattern tTenantID‑sSiteID.sandbox.mozu.com. Create a new project in Visual Studio. Choose to develop a Console Application and click OK.
Open the NuGet packet manager (Tools > Library Package Manager > Manage NuGet Packages for Solution). Search for Mozu in the online package search box. Install the Mozu.Api.SDK and the Mozu.Api.ToolKit packages, and then close out of the NuGet packet manager. Open the App.config file in your solution root directory for editing. This is the file where you specify the configuration data for your Kibo eCommerce application. Within App.config, specify your application configuration within an appSettings block inside of the configuration block, as shown in the following example, replacing the placeholder values with your application-specific values (leave the startup and runtime blocks as is): Note: You always need to specify an application key, shared secret, and tenant ID for your application to make successful calls to the API. The site ID is required for most API calls, but not all, and the master catalog ID is required for some API calls, but not all. Add a class that inherits from AbstractBootstrapper.cs, which loads dependency injections and leverages the Autofac IoC container. Right-click your project directory in Solution Explorer and select Add > Class. Name the class Bootstrapper.cs and click OK.
After creating the press release document, you can leverage the full power of Kibo eCommerce to interact with the data though the Kibo eCommerce API, Arc.js applications, Hypr templating language, or the Admin. For example, you can edit documents in a draft state, then publish them to the storefront. The drafting and publishing workflow is all managed in Admin, but can also be accessed through the API. You can query specific events or display them dynamically based on current date, user location, or any other metadata, creating the ideal experience for all customers. Furthermore, custom objects can be rendered server-side via Hypr to achieve maximum SEO. This example describes the include_documents Hypr tag method. Navigate to your local Kibo eCommerce theme directory. Open your site&apos;s theme.json file in a text editor. Note: This is the template where you add HTML to style the content that displays on your site. Refer to Hypr Templating System for more information. Build and upload your theme files to Dev Center. Go to Admin > Site Builder > Editor. Click Content > Pages > Templates > Press Release. Verify that all documents from your list display on the page.